10 Warning Signs Your Body Needs Water Right Away. Don’t Ignore These! There are many health issues that we might face in our lifetime but at times, it helps to stop and look at the possible causes of those problems. One issue that most people deal with to some degree or another is dehydration and for some of us, it is a chronic, lifelong issue. Fortunately, it is also an issue that is easy to correct. Most of us just tend to ignore our own thirst, which is the first sign that we are dehydrated. Perhaps it is because we consider it an inconvenient time or we might not like the taste of water but it either case, it could lead to some serious problems. Consider the following benefits of drinking water and what it can do for you. Dehydration can quickly sneak up on you and in some cases, it might even occur quickly if we are dealing with certain situations. For example, when you are vomiting or have diarrhea, it can lead to dehydration. Strenuous physical activity can also cause the problem. Take a look at the following 10 symptoms. If you have them, grab a drink and start hydrating. 1. Accelerated Heartbeat – Your heart rate may be affected when you don’t drink water. It lowers your plasma levels and your heart beats faster. Dehydration can also lead to stress on the body, resulting in heart palpitations. It might also lead to fear and panic, further accelerating the problem. Drink water slowly and if your condition doesn’t improve, seek medical attention. 2. Halitosis and dry mouth – If you are dehydrated you aren’t producing enough saliva. That leads to the buildup of bacteria in the mouth. 3. Cravings – The human body often mistakes hunger for thirst. That is why you are told to drink water if you feel hungry while you are on a diet. More than likely, it causes a craving for salty foods because you are lacking in electrolytes. Grab a sports drink or put a pinch of salt under the tongue and drink some water. 4. Muscle pain – friction increases between the bones when you are lacking water, leading to joint pain. Hydrate your body properly and you will find that it is much easier to manage physical activity. 5. Headaches or dizziness – If you are lacking water, your brain is lacking water. This could lead to headaches or dizziness. 6. Digestion – Your body needs water to digest food. Often, you will be constipated when you are dehydrated. Drink enough water and the issue should reverse. 7. Fatigue – are you lacking energy? You might just be lacking water. Dehydration can drop your blood pressure and your blood oxygen level. 8. Urination – Keep an eye on the color of your urine. If it is darker in color, you are already dehydrated. When you are hydrated properly, you should urinate 7 times or more daily. 9. Dry skin – Your skin is kept elastic with water. When you are dehydrated, it could lead to dry skin and lips. It may also cause other issues, such as eczema and acne. 10. Brain Fog – Your brain may not be able to effectively process information when you are dehydrated. It could begin to affect your memory and mood. The easiest way to avoid dehydration is to drink enough water during the day. 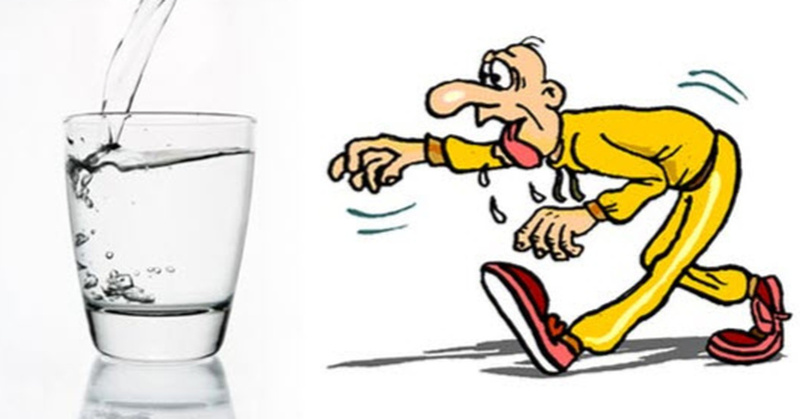 Shoot for at least 10 cups of water, although you could need more if you are sick or if you are exercising regularly. Carry a bottle of water with you and drink a full glass at each meal. It’s easy to stay hydrated if you work on it.